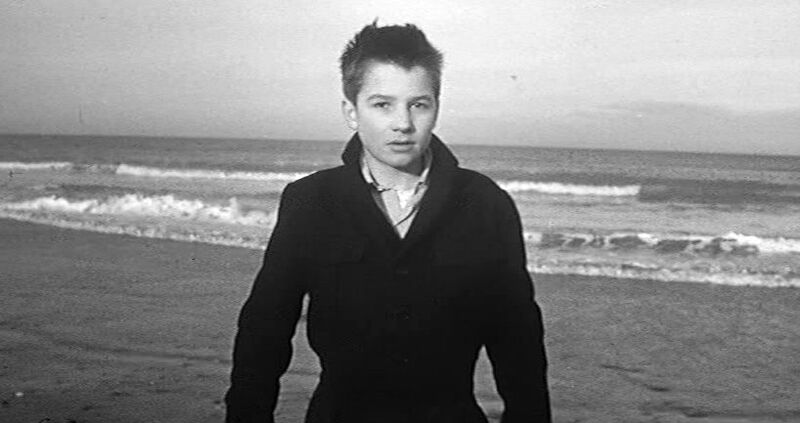 The 400 Blows (Les Quatre Cents Coups, 1959), written and directed by Francois Truffaut, stands as a landmark film in several respects – in particular because it marked, along with Le Beau Serge (1958) and Breathless (À Bout de Souffle, 1960), the beginning of the French New Wave movement in filmmaking. The New Wave (La Nouvelle Vague) emerged from a coterie of writers and critics around Andre Bazin and included Truffaut, Jean-Luc Godard, Claude Chabrol, Alain Resnais, Louis Malle, and Eric Rohmer. Their motivation was primarily that of rebellion from the conventional cinematic fare of the day, and they sought to explore more spontaneous and less theatrical forms of film expression, which makes these films difficult to typecast. Nevertheless, there is something about The 400 Blows that separates it from those contemporary works in terms of its authenticity, originality, and enduring relevance to our current existence. This was the first feature film of writer-director Francois Truffaut, and the story of the film closely parallels Truffaut’s own troubled experiences growing up in Paris. The events depicted here cover the everyday adventures of Antoine Doinel, a 12- or 13-year-old boy who struggles to make his way in a rather unsympathetic environment. The film’s title, incidentally, is derived from French phrase "faire les quatre cents coups", which means something like “making trouble” or “raising hell” and refers to the kinds of shenanigans and horseplay that teenagers the world over get themselves into. As we watch the film progress, we see that Antoine is progressively branded as more and more of a juvenile delinquent, and yet we find him to be essentially innocent and a more of a victim than a perpetrator. Almost everyone (at least among men, I think) can identify with Antoine’s experiences and understand things from his perspective. The story of the film is quite episodic, but it transpires almost in progressive round-robin fashion across three social environments of varying degrees of intimacy and control. The Institutional Environment (IEnv). This is the adult social world, and for Antoine, it is initially his public school, although it later devolves into the correction system and reform school. There are rigid rules administered by adults that must be followed, or penalties will arise. For essentially minor offences Antoine finds himself ostracized and eventually cast out of his school and into a harsher regime. The interactions Antoine has with people in this realm are cold and formal, with no empathy or sympathy extended. The Home Environment (HEnv). This is a more intimate environment, but is also run by adults. Here rules are set, but more personal and nurture-motivated interactions are expected to prevail. The interactions with his parents are more personal, but they are burdened with hypocrisy and selfishness on the parent side. The Friends Environment (FEnv). This is the only honest and personally straightforward space for Antoine. Although there are some classmate rivalries, Antoine’s best friend, Rene, is the only person who is willing to share things equally with Antoine. Note that by identifying these three spheres of activity, I do not mean to suggest that the film embodies a global, gods-eye architectural view of existence. It is very much an existentialistic story seen from Antoine’s point of view, but within these three perspectival contexts. Throughout the story, Antoine is amazingly straightforward with everyone, and indeed he rather manfully accepts his misfortunes without complaint. But we sense the unspoken: that he seeks escape from a suffocating world of hypocrisy. He, like all young teenagers, wants to have the chance, at least sometimes, to have fun. As the film story progresses, it moves, via slow disclosure among the three realms, through four general stages of increasing alienation for Antoine. 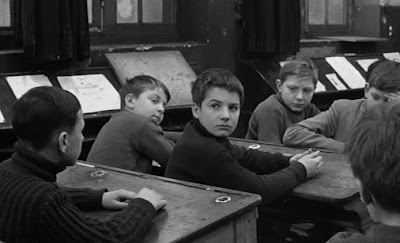 In the opening sequence at school (IEnv), Antoine and his mates (in an all-boy classroom) are shown to be bored with the stultifying pedantry of their dogmatic teacher. Antoine is unlucky to be the one caught with a naughty picture that is being surreptitiously passed around during the lecture. At home in his family’s cramped apartment (HEnv), Antoine’s strict mother reveals herself to be rather vain and impatient with her son. There is also tension between his father and mother, whose suspected marital infidelity seems to be almost an open secret. With Antoine’s friend (FEnv), Rene, however, life is more congenial. The next day the two friends decide to play hooky from school, and they have fun at a movie and an amusement park. On the street, though, Antoine happens to see his mother in the distance kissing a strange man; and she also notices Antoine, which turns out to have short-term benefits for Antoine. Anyway, Antoine now needs to come up with an excuse to give to the teacher as to why he missed class that day. Unwisely following Rene’s advice that big lies are better than small ones, Antoine reports at school that his absence was caused by his mother’s death. The lie is quickly exposed, and Antoine is harshly slapped in front of the whole class by his father. Antoine’s standings in the IEnv and the HEnv have reached new lows. Disconsolate, Antoine decides that his only option now is to run away from home, and Rene lets him into his uncle’s abandoned print shop to sleep there. But the next day, Antoine’s mother shows up at school to fetch Antoine home again. She is probably concerned that Antoine will snitch about her likely observed infidelity on the street, and she now treats her boy with motherly kindness. She offers him a big prize if his upcoming school essay gets a good grade. With idealistic fervor, Antoine is so inspired from reading one of Balzac’s works that he commits some lines to memory, and he sets up a little shrine with a candle in the apartment to honor the great writer. When the burning candle causes a fire in the apartment, though, Antoine is surprised to see his mother kindly intervene to stop his father from punishing the boy. Then, somewhat out of the character we have seen so far, she gaily urges them all to go out and enjoy a movie. So the HEnv situation seems to be much better now. Later in school, though, everything collapses. Antoine’s memorized phraseology from Balzac leads to a plagiarism charge and expulsion from the school until January (the events in this film appear to be taking place in the Christmas season, so January would be about a month away). When Rene loyally sticks up for him, he is also expelled, for impudence. Antoine now stoically accepts that his parents will utterly reject him, and he decides to run away again and stay with Rene, whose parents are well off but neglectful of what their child is doing. Antoine has now chosen the FEnv to the exclusion of the IEnv and the Henv (how many boys have not contemplated such a choice at some point?). Back on the street the boys are having a raucous good time again – going to movies, smoking cigars, taking in a puppet show, playing backgammon, and naughtily shooting their peashooters at passers by from an upstairs window. But they soon realize that if they are going be on their own, they will need money, and they decide to steal a typewriter from Antoine’s father’s office and pawn it. This scheme disastrously falls apart, and Antoine is arrested and turned over to his father. On visiting day his mother and Rene separately show up, but only his mother is allowed in. And she is only there to issue her final rejection. “Don’t play the martyr”, she says, “your father says he doesn’t care what happens to you.” Now the FEnv and HEnv are closed off to him, and only the constrictive IEnv remains. Unbowed, Antoine slips away from the center during a soccer game and runs. In a memorable eighty-second tracking shot, we see him running desperately, finally arriving at the seashore, where he can go no further. There are several key elements to the film that enhance the emotional effects so important to the film. The piano music score of Jean Constantin is lyrical and wistful, evoking a sense of inner loneliness. The acting performances are excellent, particularly that of Jean-Pierre Leaud as Antoine. Of memorable note is Leaud’s naturalistic responses to the psychologist’s interrogation near the end of the film. Leaud would go on to become a favorite actor of Truffaut and Godard, but his debut performance here, so authentically embodying innocent earnestness without self-pity, was his best, in my opinion. Albert Remy and Claire Maurier who played Antoine’s parents also do well to portray parents with initially good intentions but who are too preoccupied with their own selfish concerns. The cinematography of Henri Decaë is also noteworthy. Decaë is one of my favorites, and his work with Chabrol and Jean-Pierre Melville I highly recommend. Here he managed effective compositions in the difficult cinemascope (2.35:1 ratio) framing and executed numerous moving-camera shots (including that long tracking shot at the end) with great effect. 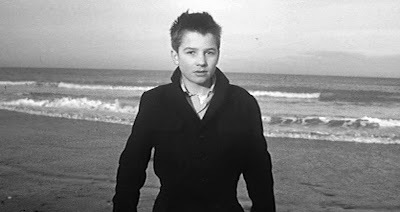 The 400 Blows, much better than other well-known youth films of the time, such as The Wild One (1953) and Rebel Without a Cause (1955), captures the innate existential longing that young people have for something more engaging than the dim and compromised world that is set before them. Antoine is branded as a troublemaker, but we can so readily identify with him that we should all be equally so branded. He is not malicious, but like all boys, he wants to have some fun sometimes, too. The story seems commonplace, but Truffaut tells it so well that it captures the essence of this inarticulate feeling that there must be something more to life. Truffaut made many fine films in his career, but he never surpassed this one, his first feature.